Harrisburg Rugby Football Club, founded in 1969, had a dream that was initiated many years ago. The goal was to find a permanent home, a field and a foundation from which we could grow the sport of rugby in Central Pennsylvania. Our vision for this property is a sports facility that will house one to three pitches, with ample parking for players and spectators. The fields will have permanent goal posts and flood lights for evening practice, and we would eventually build a clubhouse. The clubhouse will eventually have showers, changing rooms and a kitchen. The entire facility will be used for games, tournaments, fundraisers, and community activities, as well as be available for other area sports. The plan is aggressive and bold – but with your help I know we can make this dream a reality. What started as a single men’s club team has grown into a total of seven teams. HRFC is currently made up of four U19 (under 19 years of age) teams: West Shore United Girls, Cumberland Valley Girls, West Shore United Boys, and Dauphin U19 Boys; and three senior teams: Men’s, Women’s, and H.O.B.O.S. (Harrisburg Old Boys Occasional Side - over 35 years of age) club teams. Despite having such a large rugby footprint in Central Pennsylvania, during the 45+ year history of HRFC, the club has been a nomadic rugby club - playing in multiple parks and on multiple fields around the Central Pennsylvania region. It is our dream to end our nomadic nature. 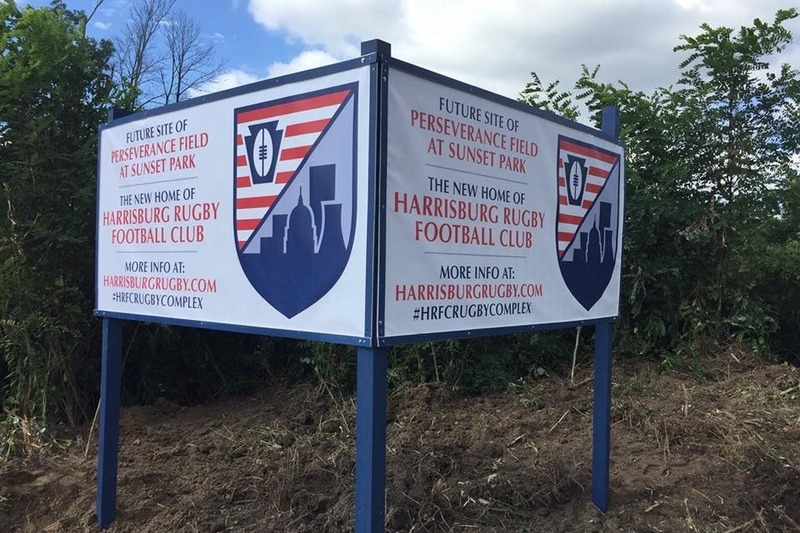 Over the next 5 years, Harrisburg Rugby Football Club would like to purchase and develop land in the Harrisburg, Pennsylvania area - a place to call home. The development plan is aggressive and requires a high amount of capital, but also generates a great potential for return on investment. The plan requires $800,000 - $1 million to be raised in order to be completed. This price includes, land development, and further rugby complex development. 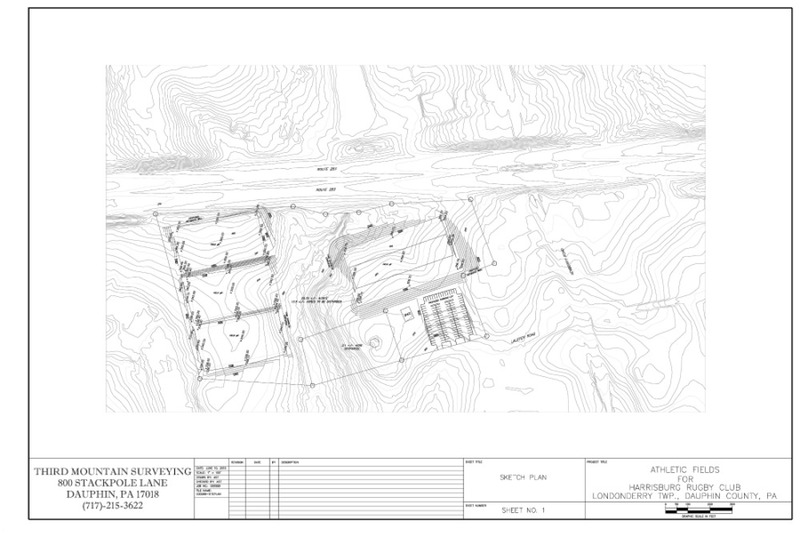 Phase 1 – Construction: The property will undergo grading to level the fields. Retaining walls will be installed. A parking lot will be completed. Top soil and seeding will be applied. Estimated September 2018. Phase 2 – Operation: In addition to field usage, the club plans to raise money through ongoing field rentals. This will come in the form of practices, games, and tournaments. The club has had preliminary discussions with local organizations, such as Capital Area Soccer Association (CASA) and Harrisburg Young Professionals (HYP), in which they expressed interest in future field rental opportunities. Estimated September 2018. HELP MAKE OUR DREAMS A REALITY. DONATE TODAY! 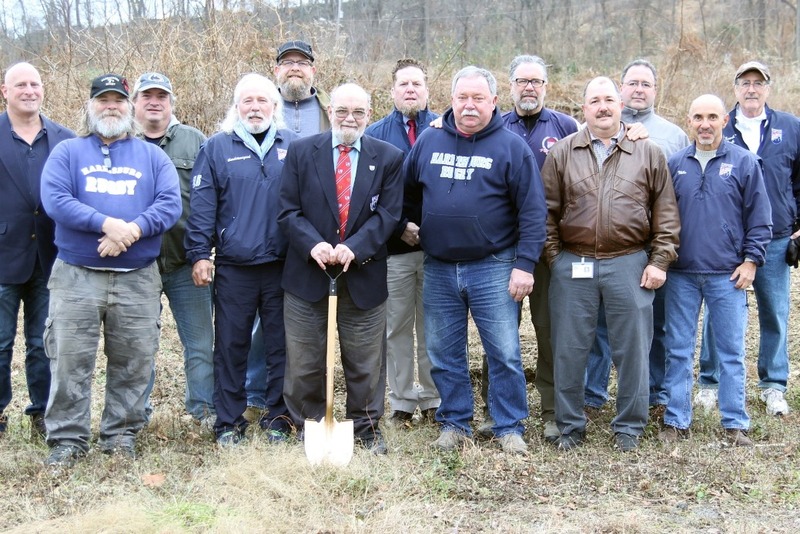 On Friday, November 30, 2018, Harrisburg Rugby Football Club, in conjunction with Londonderry Township in Dauphin County, PA, has broken ground to begin construction of Perseverance Field, the future home of the Harrisburg Rugby Football Club. We want to send to you a brief update on our field status, as this a momentous occasion for the rugby community within the Eastern Pennsylvania Rugby Union. 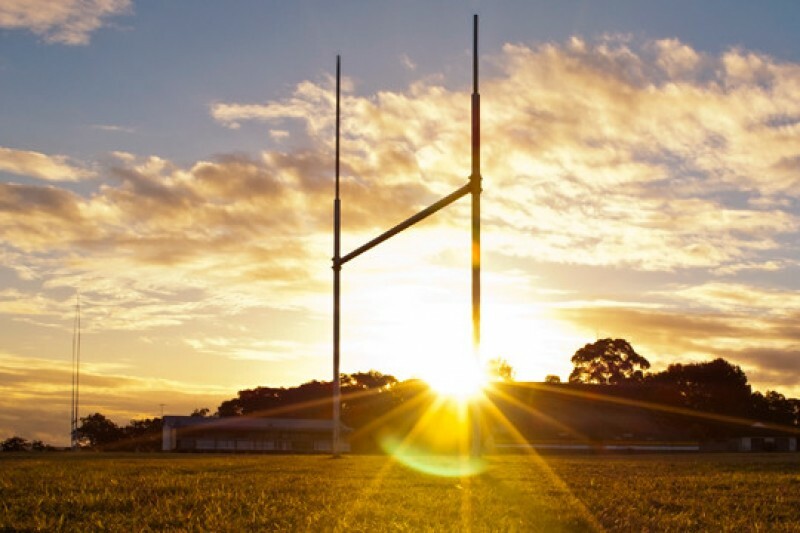 These types of facilities will help to secure field space for various events and opportunities that are going to help grow the game of rugby at various levels of the game – high school, collegiate, club, 7s. There will be three fields, one international size, that will be unlike any other field set up within our region. The fields should be ready for the 2020 competition cycle, but we will issue further releases to keep you updated on field availability. 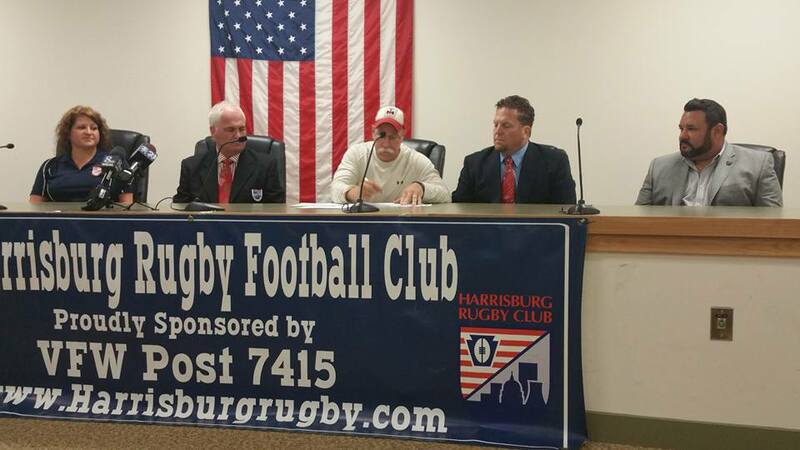 The Harrisburg Rugby Football Club was founded in 1969 and is approaching its 50 year anniversary. The men and women of Harrisburg Rugby Football Club invest in the Central Pennsylvania region by providing support for community development through recreational activities; to encourage and promote the ethos of camaraderie, discipline, and respect to other underserved entities. Growth and development of the rugby community is our goal. If you wish to contribute to the further development of the field complex, you may make a donation through this GoFundMe website! For additional information, please contact Jeffrey Cook, Chair of the Harrisburg Rugby Football Club or Julie George, Futures Committee. It is with pleasure and excitement that we write this update to inform our family that we officially break ground on our permanent home this week – Friday, November 30th at 10:00am. After 3 years of hard, and at times, stressful work, the wonderful Futures team has managed to secure our home, negotiating a fantastic deal with a consortium of contractors to break ground this week, getting us to stage 1 of our project. Our sponsors in business and government grants has made this possible, not forgetting the members of this club and our gofundme donors who believed in the project and injected personal funds to help us get this off the ground. The initial stage of the project will give us a full size IRB field and near size training field to practice on. This will be the best facility for our sport on the East Coast, and one of the best in the USA. This is wonderful news for our club but we need to keep pressing forward to finish the project. Many of our members, both past and present, said that they would donate once they see this project start! It’s time to make that donation, we are starting, and not finishing until we have the facility we dreamt of. Ground breaking is going to be this Friday, November 30th at 10:00am, and we hope to have the local TV stations and press at the ceremony. Our personal thanks go to all those who have dedicated so much time and effort to make this dream come true! 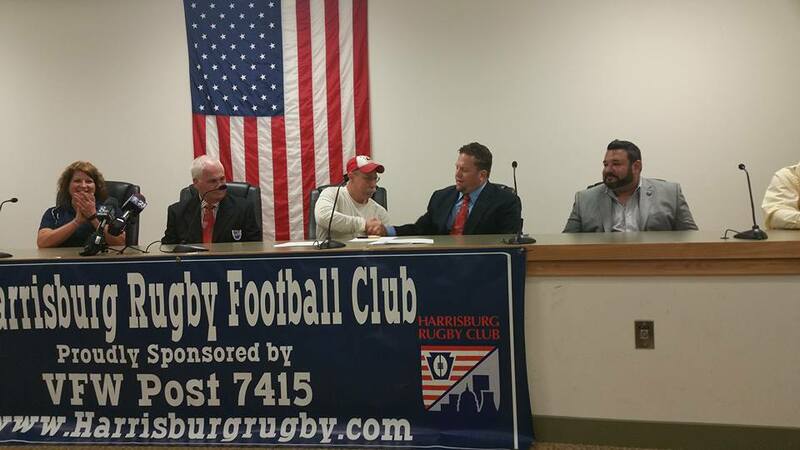 Today we mark a HUGE milestone on our path to create a permanent home for Harrisburg Rugby. 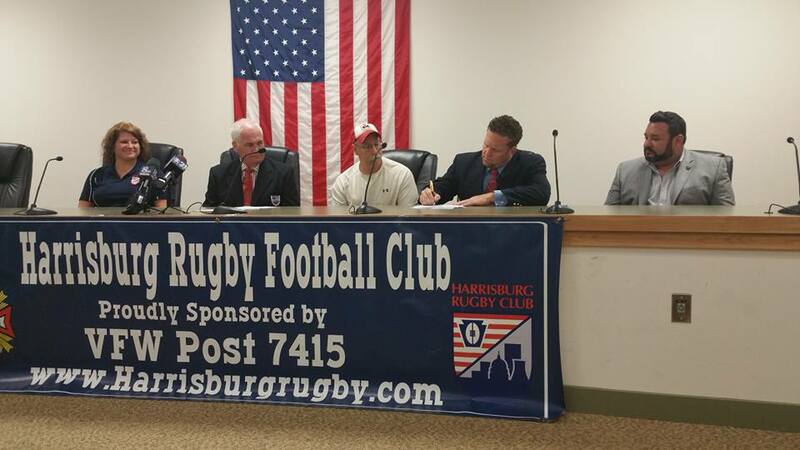 On September 1, 2016, at 4:00pm, Harrisburg Rugby Football Club joined in partnership with Londonderry Township to sign a long-term 50 year renewable lease in order to start developing our own fields and facility adjacent to Sunset Golf Club! The 8-acre facility will have an international-sized pitch, two additional pitches, and eventually even a clubhouse for our teams, families and supporters! We would like to give a MASSIVE THANK YOU to everyone who has already supported us, whether financially or with your assistance behind the scenes! Without you, we would not be celebrating this incredible benchmark! We need the continued support of individuals from both the club and the general public. Please share our story with your friends and family, and don't forget to donate today! Now that the massive hurdle of acquiring land is behind us, it's time to hit the ground running. Keep an eye on this page for many more updates as Harrisburg Rugby endeavors to turn this dream of a rugby home into a reality! 50 year lease sealed with a handshake! 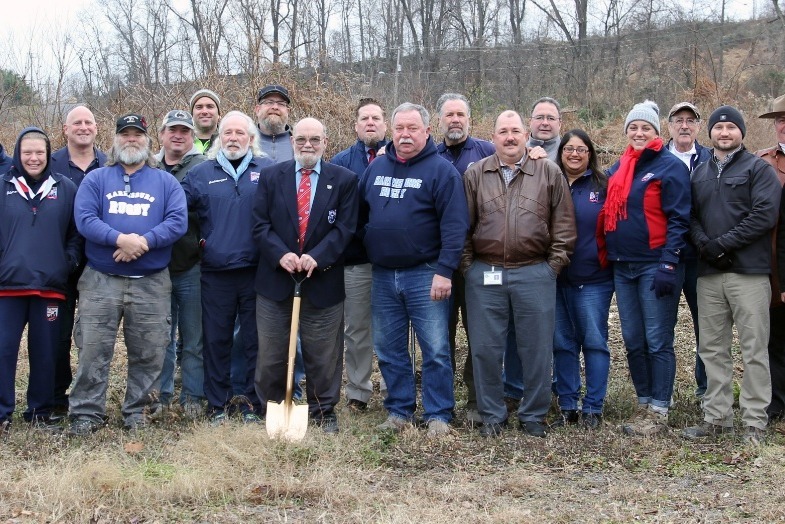 The Harrisburg Rugby Futures Committee has been hard at work to get this project jump started. So much has been happening behind the scenes over the past month, and we felt like it was time to offer an update to you, our generous donors, and our many future donors. 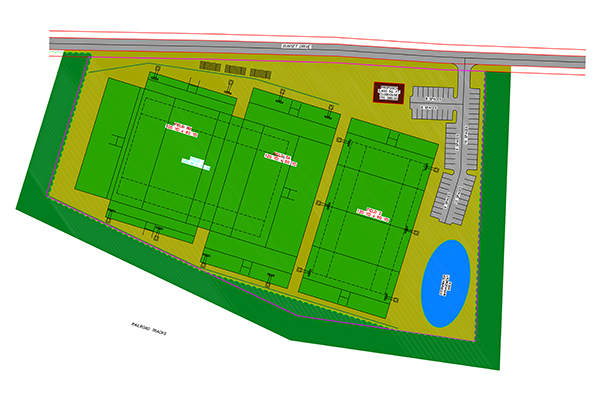 Attached is the Preliminary Grading Plan for the fields. 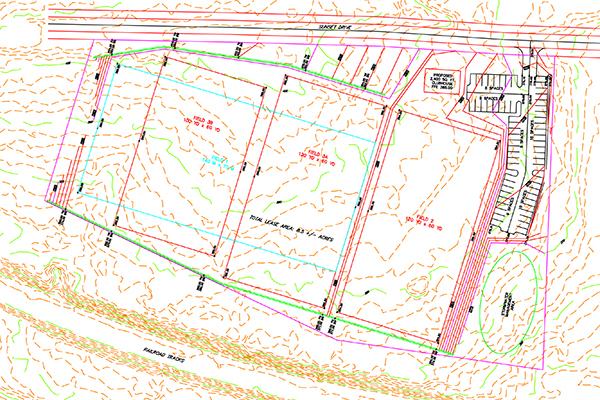 As you can see, we are able to develop this plot of land into 4 pitches. Pitch #1 is a full size 100M x 70M field with 20M try zones. This is a full size international rugby pitch! Pitches 2-4 are not as large, but still large enough to be considered full size rugby pitches. They are 100 yds. x 60 yds. with 10 yd. try zones. With this pitch layout, we will not have to disturb any of the adjacent trees and will simply have to fill and grade the land to create level playing surfaces. This means that this plot of land will remain "Clean & Green" - something our club is very passionate about! The parking lot, as shown, has 121 spaces. This will be large enough to accommodate our club and any visiting clubs without infringing on the area we plan to use for the septic system. Our Futures Committee met last night, and after some back and forth with the current land owners, we are ready to make an offer on the property. The Letter of Intent to purchase will be delivered soon. Once that happens, our clock really starts ticking! We would like to offer a sincere THANK YOU to all of you who have contributed already. Because of you, we are one step closer to making our dream of growing the sport of rugby in the Central Pennsylvania area a reality! Cause who doesnt want a giant rugby complex in their back yard? No thanks.